Parkdale’s Marching band comes back with a BANG! The band, along with the newly “renovated” dance team, is marching its way back to Parkdale. This dynamic duo was both seen in action during the spirit train, their first big performance and without a doubt, their best. Although the marching band has returned, there have been some struggles to overcome. Students not enrolling in the marching band is a major problem that the program itself faced for years, despite the fact that practices aren’t very hectic. “We practice three days a week from 2:30 to 4:30 and that’s only for the first quarter,” said Mr.Martin. While Mr. Martin has struggled to find students to sign up, the end result of the band itself has been appreciated by many in the school community. In addition to being something to look forward to, some students–present and former– feel the marching band is a great tool of school spirit. 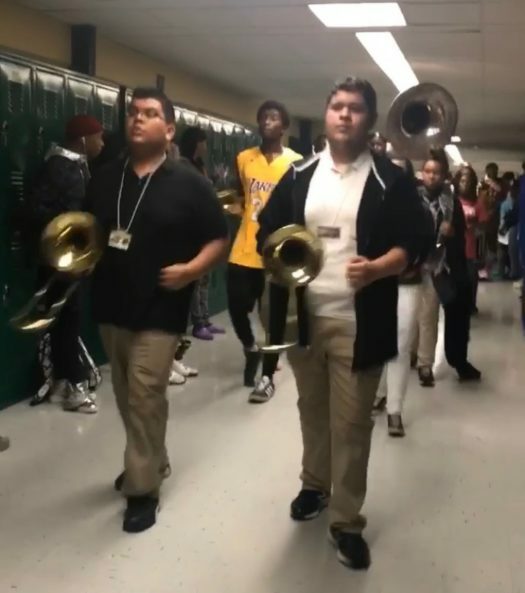 “[The marching band] added spirit to [school] because it brought smiles and cheers to the student reminding us students that Parkdale is our school home,” said Jese Vasquez, a graduate of 2018. These Parkdale graduate remember their memories of the marching band and how it brought more spirit to the school during the spirit trains, pep rally, and overall events in school because that’s the effect the marching band, the cheerleaders, and the dancers have.